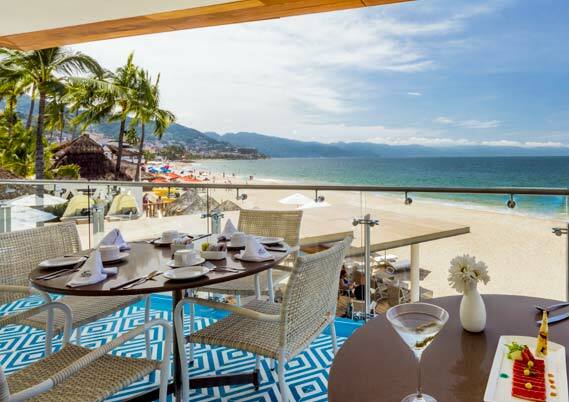 Located beach front, in Puerto Vallarta, is Villa Premiere Boutique Hotel & Romantic Getaway. A luxury resort, features an oasis for couples, or adults seeking a relaxed and intimate getaway. From the moment you arrive it offers a sensorial experience of aromas, spectacular ocean views, modern contemporary décor and superb personalized service. Our butler staff welcomes you with a refreshing sparkling wine, and after your selection of scents and pillow menu, you proceed to a welcome 5 minute massage., to continue to be amazed with your selected ocean view suite. This resort features 80 luxury rooms and suites, and a recently investment of 3.8 MDD in renovated facilities. Ocean front resort with breathtaking landscapes, and amazing culinary experiences. Proud participant of the 22nd edition of the Gourmet Festival, prides of the taste, service and quality of its 3 a la carte restaurants.